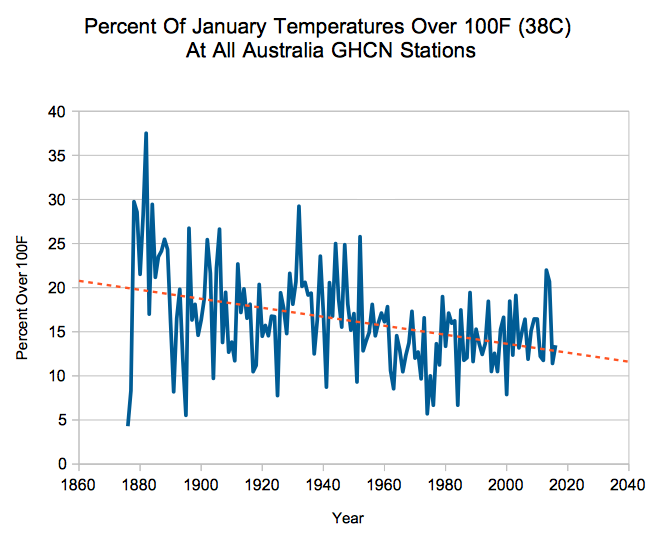 Hot January days (over 38C) in Australia peaked in 1882, and have declined about 50% since then. Very similar to the pattern seen in the US. During January 1882, more than one day out of three was over 38C. 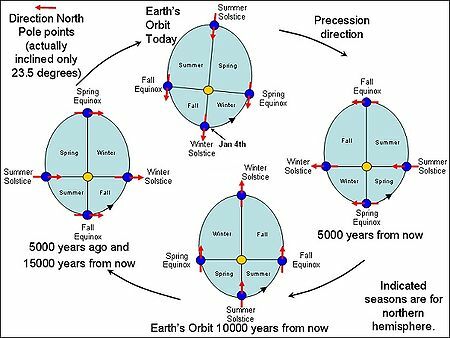 “The dates when Earth reaches the extreme points on its orbit are not fixed because of the variations in its eccentricity. In 1246, the December Solstice was on the same day as the Earth reached its Perihelion. (my note: cold tilt, hot orbit for NH, hot tilt, hot orbit for SH) Since then, the Perihelion and Aphelion dates have drifted by a day every 58 years. In the short-term, the dates can vary up to 2 days from one year to another. At winter solstice the NH is tilted away from the sun and the SH tilted toward the sun. At perihelion the earth is closest to the sun and at aphelion farthest from the sun. So at winter solstice and perihelion coincidence (1246) the SH gets double hottness and at aphelion the SH get double coldness. As the tilted earth preccesses away from perihelion the NH tilts toward warmer and the SH tilts away to colder. How many W/m^2 does it take to change the temperature rate by 1.0 C/y? The solar constant ranges from 1,413 W/m^2 at perihelion to 1,323 W/m^2 at aphelion, 90W/m^2 or 0.24 W/m^2 per day. The earth has been precessing away from perihelion since 1246, in a direction that leads to NH warming & SH cooling. BTW 261 years of more CO2 added 2 W/m^2 of RF. Don’t forget that the obliquity (axial tilt) also varies. I recall it being taught as 23.5 +/- 1 degree. More recently, I’ve seen it vary from 22.1 to 24.5, so 23.3 +/- 1.2 degrees.